ConCut provides professional concrete cutting services at competitive prices while maintaining the highest safety and quality standards. Don't hesitate to call to discuss our many services or to confer on a specialty project that you may have. 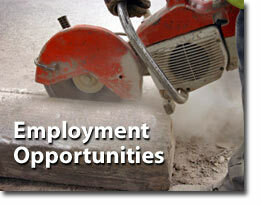 ConCut Southeast is looking for individuals interested in working in the concrete cutting and coring field. Experienced concrete cutters are desired, but we will train candidates who have an interest in entering this exciting field with great pay and benefits. Please contact ConCut for additional job information!